Photo courtesy of Jonathan Grossman. Found at an orchid garden in Guangzhou, China. If you want to keep the danger away at the sperm bank, just remember to bring an umbrella. Must be Bank of America. 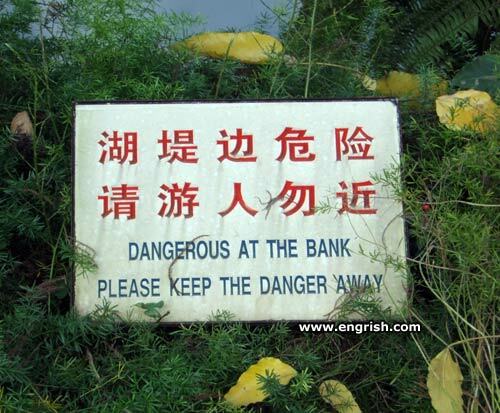 I forgot to bring my danger with me today but thanks for the warning. It’s dangerous when the plants on the bank are shooting. Beware: Rabid surcharges in area. That’s why I use direct deposit. Maybe they were thinking of BCCI? Someone donated blood infected with Hepatitis C Virus to the bank! Please do not hold up the river bank and steal the water; we need it. Sincerely, California. Keep your friends close and your bank closed. I’m not dangerous at the bank because they have a SAFE. Bernie Sander’s new Campaign slogan.